What do we really mean when we use words like cure and restoration? And what does it mean for something to be considered natural or normal, whether we are talking about a person or an ecosystem? Eli Clare acknowledged during his 2019 Fordham Distinguished Lecture on Disability that these and other difficult questions he raised in his talk come without easy answers. During his wide-ranging lecture, Claire analyzed what it means to restore something to its natural state. He also identified examples in which the paradigm of restoration falls short—as in instances of disability at birth when there never was a “before” that could be restored. A writer, activist, and teacher, Clare wrestled with the notion of cure. Not entirely against it nor entirely for it, he embraced the ambiguities and contradictions of this “messy middle,” yielding no tidy solutions, but rather providing attendees with a starting point for vital, challenging conversations about disability and environmental destruction. His talk, titled “Notes on Cure, Disability & Natural Worlds,” explored the meanings of words like restoration, natural, and normal, contextualizing the ideologies and assumptions that underlie their use, and considering what this language reveals about our culture and thinking. The lecture built upon concepts explored in Clare’s latest book, Brilliant Imperfection: Grappling with Cure. 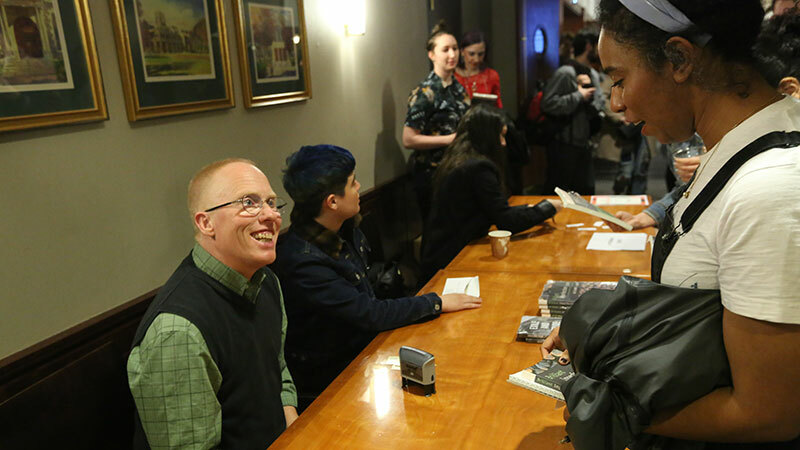 Clare’s writings “challenge us to think deeply about the ways that racism, ableism, homophobia, and transphobia shape our perceptions of what constitutes a ‘normal’ body-mind or a valuable life,” Interim Provost Jonathan Crystal said while introducing the lecture. In his lecture, Clare called for a “broad-based grappling” with “the ideology of cure”—a way of thinking that has subtly permeated our culture. Cure, by its very definition, Clare explained, carries with it the notion of restoration—of something damaged in need of fixing. “How would I, or the medical-industrial complex, go about restoring my body-mind?” Clare continued. By engaging with topics ranging from the pernicious assumptions about disability embedded in a Sierra Club antipollution advertising campaign to the work of environmentalists striving to transform a former agribusiness cornfield back to tallgrass prairie, Clare also explored connections between environmental loss and body-mind loss. Bella Eitner, a sophomore at the Rose Hill campus who is pursuing a minor in disability studies, said she found valuable lessons in Clare’s writing and activism. “I think getting into advocacy is really important, and a lot of the things that he says about it are very useful, especially coming from someone with a disability himself,” Eitner said. The annual Fordham Distinguished Lecture on Disability, now in its fourth year, is organized by the Faculty Working Group on Disability and co-sponsored by the Provost’s Office and the Office of the Chief Diversity Officer.